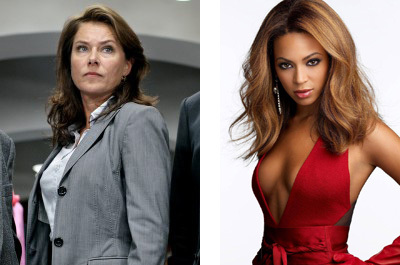 What do Birgitte Nyborg and Beyoncé have in common? Scandi-drama Borgen is one of my (Agent Pete’s) favourite TV shows. I’m hooked on the political intrigue, spin doctor skullduggery, and newsroom backstabbing. Towards the end of this, the third series, Birgitte, who smashed her way through the glass ceiling in series one to become statsminister (prime minster) only to lose the office, has launched a new centrist party to challenge the one she once led, The Moderates. But her New Democrats are failing to gain traction with the electorate, who seemingly can’t tell them and the Moderates (who’ve been nicking their policies) apart. Her lightbulb moment comes when her British architect boyfriend suggests she needs to do something dramatic to win over the voters. So the politician whose party could tip the balance of power one way or the other in this parliament of coalitions decides to disassociate herself from both the left wing and the right. It’s daring, dynamic and audacious, and the voters love her for it. And what of Beyoncé? Last Friday she released a new album no-one saw coming. There was no launch, as such: no promo interviews or performances on the world’s best-watched TV shows, no supporting single, no advertising campaign – it just came out on the iTunes store. Immediately there was a flurry of press interest. On social media feeds, the headline from music website Popjustice caught my eye first: ‘There’s a new f***ing Beyonce album on iTunes’ (my asterisks, not theirs) they shrieked. This was quickly followed by dozens of similar bulletins, posted by media as diverse as trendy music blogs and serious broadsheets. And within about an hour Popjustice had (to my knowledge) the first album review online. The album in question went on to sell a whopping 830,000 copies over the weekend (reaping more positive PR into the bargain). And that, my friends, is a record-breaking record. Now you could argue that one of the world’s largest recording artists could get away with ‘just releasing’ a record, and it selling by the bucketload. But my guess is that there were still tough questions being asked at her production company’s HQ, and at the offices of Sony Columbia. The music industry is more conservative than you might think, and this daring, dynamic and audacious approach – to generate an immediate demand by throwing a publicity hand grenade into the marketplace – was an audacious marketing gamble on the part of all involved. We all operate in crowded marketplaces. We need to do something different to stand out from the crowd, and win the attention – and hearts – of those who would be our customers and clients. We believe businesses need to be daring, dynamic and audacious. And we say as much in big orange letters on the homepage of our website. We run The Listening Device for businesses that want to stand out from the crowd. If you want our help to be more daring, dynamic and audacious in 2014, get in touch! This entry was posted in Marketing tips, PR, Social Media and tagged audacious marketing, Beyoncé, Birgitte Nyborg, daring marketing, marketing advice, Marketing tips, Secret Agent Marketing, The Listening Device. Bookmark the permalink. One Response to "What do Birgitte Nyborg and Beyoncé have in common?"